Undebt.it is a debt payment manager that will generate a plan for you to get out of debt by paying extra amounts on certain accounts until they are paid off. All of the payment plans that Undebt.it can use are all rollover plans, meaning that extra payments are rolled from one debt to the next and so on. This type of debt payment system was generically popularized by Dave Ramsey's Debt Snowball. 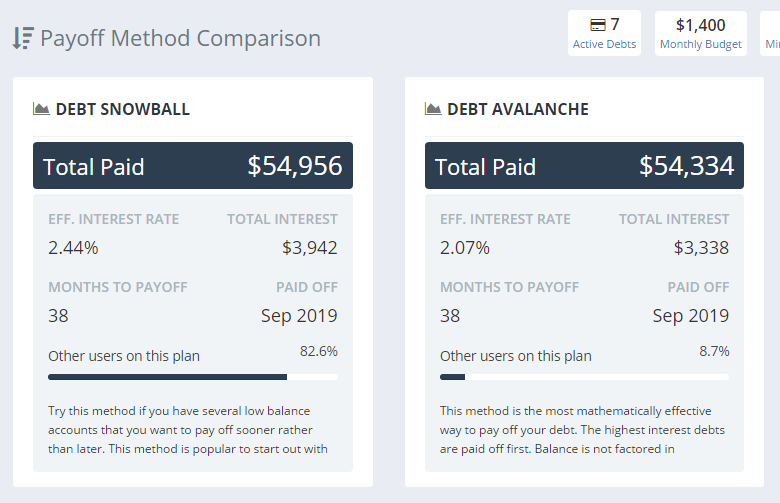 The two most popular payment plans are the debt snowball (paying the lowest balance account first) and the debt avalanche (paying the account with the highest interest rate first) which is also called "debt stacking". You can use either of those plans with Undebt.it or one of the several other methods detailed below. The debt avalanche is mathematically the most effective, but all of the rollover methods work well and will get you debt free in a similar amount of time; just choose the plan which works the best for your situation. Remember, you can change the payment plan at any time you like. Visit the new user registration page and add a few pieces of information to get started. The "budget" amount is the total amount you can currently afford to pay each month (the minimum payments on all debts plus whatever extra you can afford). You can use your Google, Facebook or Twitter account to sign up if you like. The next step is adding all of your debt information. You'll need to know things like your balance, interest rate, current balance and minimum payment amount. 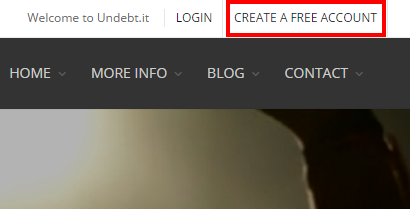 Undebt.it doesn't connect to your bank or credit card account, so personal information like account numbers and passwords are NOT collected. 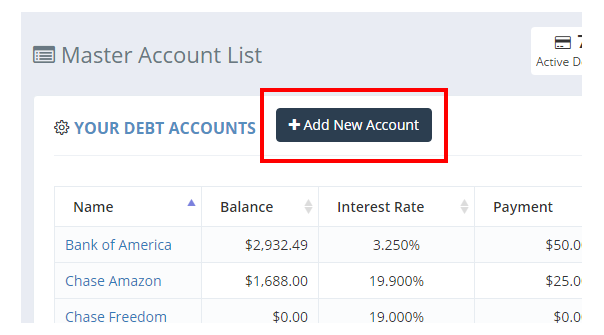 You can add as many new debt account as you like or edit/delete existing ones as needed. The Dashboard is the heart of Undebt.it and it's where you'll be spending most of your time once you are up and running. 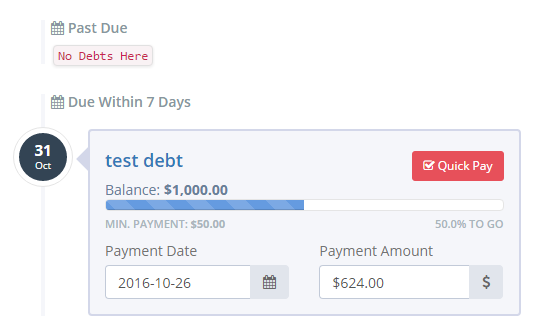 You'll be able to see exactly when each debt will be paid off as well as how much interest you will have paid in an informative summary debt list view. There's also a payment manager where you can easily record your payments; it helps keep you on track so you won't be late with your payments. You can even make partial payments and the payment manager will adjust payment amount as needed. 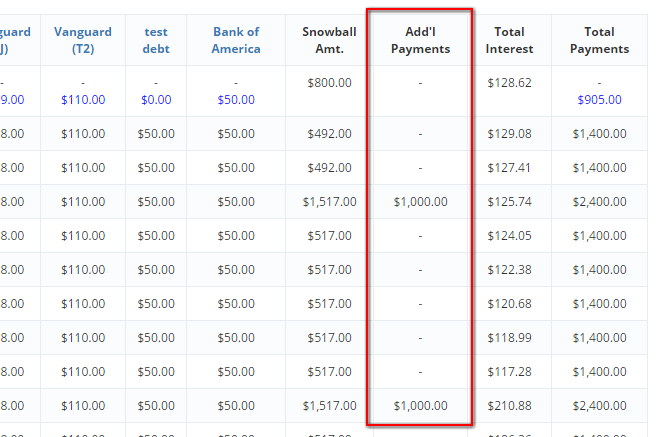 Check out the Debt Snowball Table for a detailed look at each month payments. This is a great way to visualize exactly how the snowball payoff method works. For the current month, the table highlights how much you have paid on each debt and how much you have left to go. 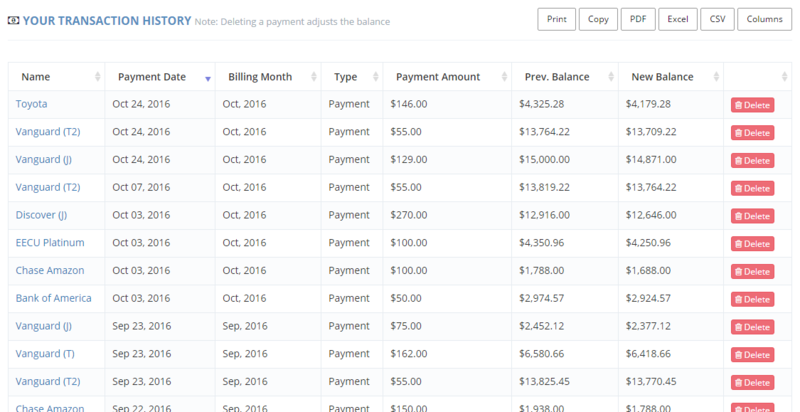 You can also see any debt snowflake additional payments, overall running balance and even the total amount being paid in interest for each month. 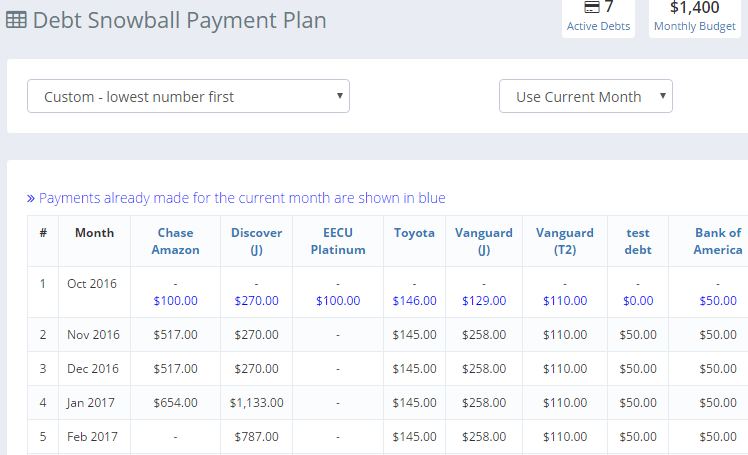 Choose a different payment plan from the list and see how your payoff plan is effected to see which one is going to work best for you. 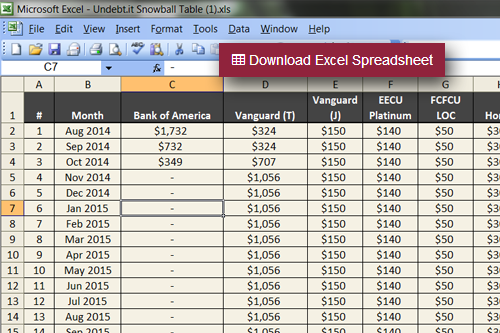 You can even export the debt snowball table into an Excel file if you like. 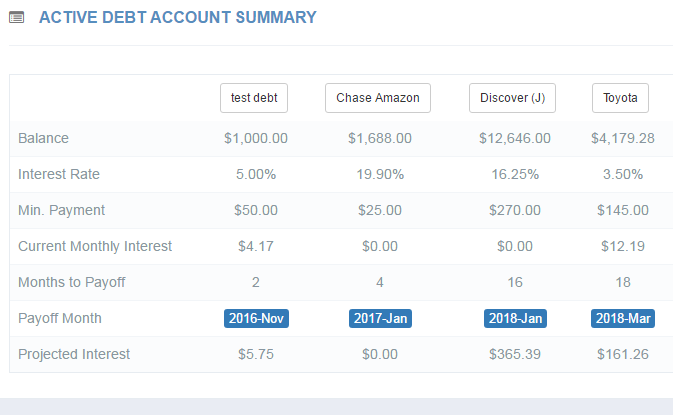 The Debt Snowball method is when you pay the accounts with the lowest balance first. The idea is that by paying off accounts in a shorter period of time, momentum is built up and help keeps you motivated by accumulating small victories. Also called "Debt Stacking", it's the most mathematically effective way to pay down debt, the avalanche method focuses on the accounts with the highest interest rate first. If you are not sure which payment method to use; try this one first. The idea behind the Debt Hybrid plan is to bring together the best parts of the snowball and avalanche payoff methods so that you can pay debts off quickly and effectively while at the same time maintaining your motivation. You can use this plan if you are looking to gain budget flexibility. By eliminating the debts with the highest monthly payments first (like auto loans) you can free up cash resources. Credit utilization is a large factor in your FICO score. This plan pays down accounts that are closest to their maximum credit limit first. If you are looking to improve your overall credit score, this plan may be a solid option. This plan is similar to the debt avalanche plan in that it focuses on eliminating money wasted on interest. The difference is that it takes into account the actual dollar amount of the interest paid each month instead of the actual interest percentage rate. Unlock the power of Undebt.it by creating your own custom debt payoff plan. You have full control over the payoff order of your debts and can fine-tune the order at any time. There are two custom plans, highest number first and lowest number first. These two plans give you full control over how you pay down your debt. The highest/lowest refers to the "payoff order" number on the debt details page. 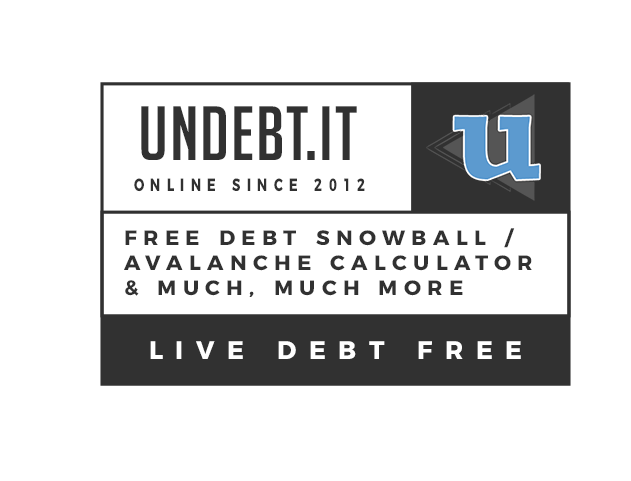 Undebt.it allows you to add any future extra or one-time payments, or "debt snowflakes" into your debt snowball. 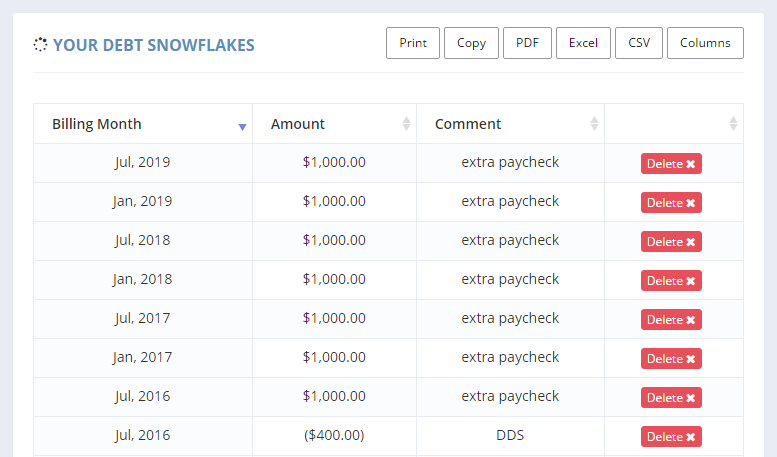 For example, if you're expecting an extra paycheck, tax refund or a performance bonus at work, put it towards paying down your debt by adding them to the Debt Snowflakes page. The snowflakes are shown on the snowball table page. You can add as many snowflakes per month that you want. You can even add a negative snowflake on months where you are planning on short paying your debt snowball. 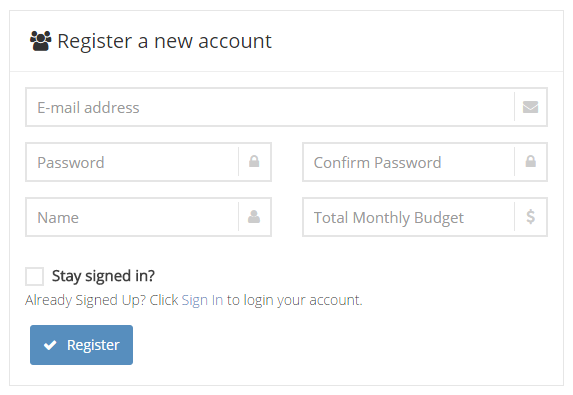 You can quickly add payments the dashboard page or the debt account details page. Your due date will be adjusted as well as the account balance whenever a payment is added. You can add multiple payments for the month by choosing the same billing month. 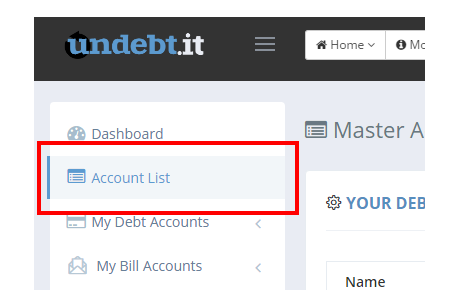 Purchases can also be easily added on the debt details page. 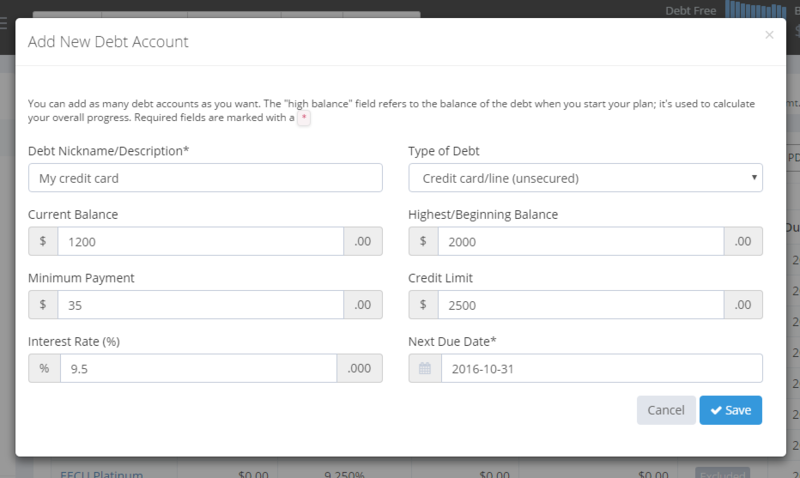 Undebt.it keeps a fully sortable and exportable history of payments & purchases for each account. 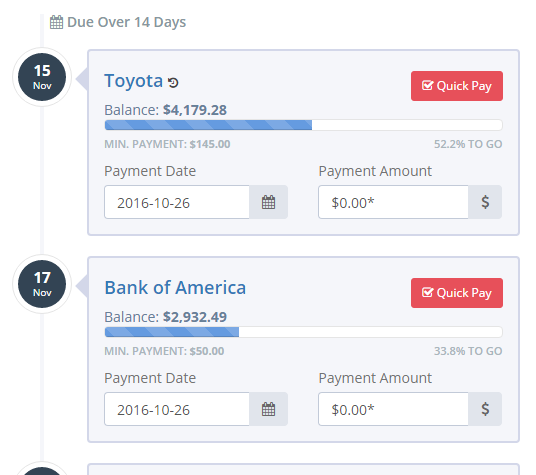 Check out the compare methods page to see exactly how each payment plan will work in the long term. You can see if using a different payment plan will get you out of debt sooner or if you will be paying less in interest over the life of the loan. 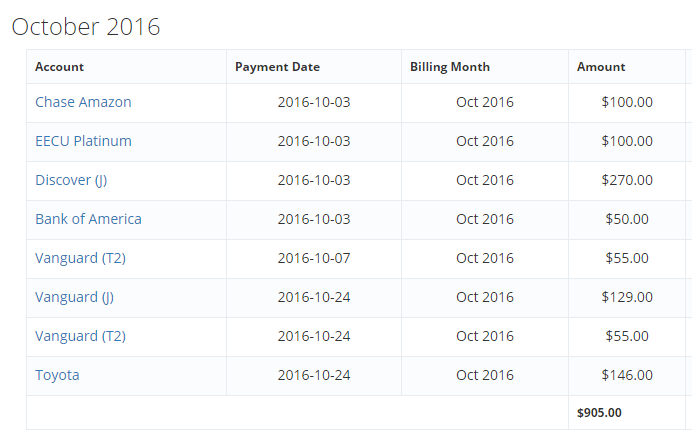 The compare page shows you how each of the payment plans supported by Undebt.it will work with your account situation. One of the most important aspects of improving your credit score is keeping a low credit utilization. 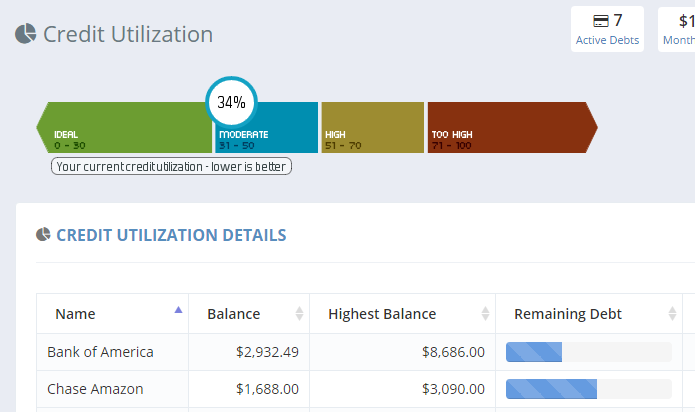 The credit utilization page shows you exactly where you stand with each of your accounts. 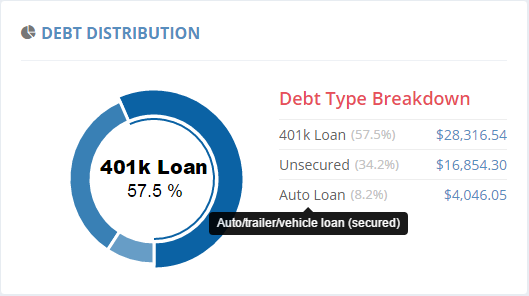 There are also pie charts that you show the distribution of your interest rates and types of loans. The utilization graph gives you some visual goals to shoot for. 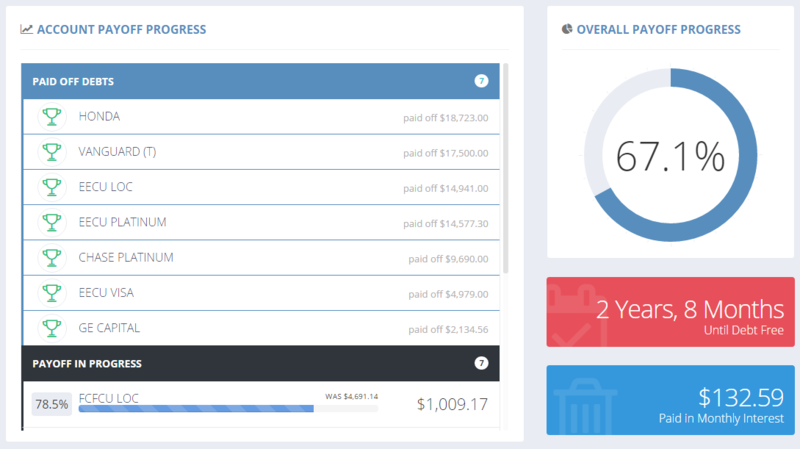 Now you can visually see exactly how your debt accounts are distributed. Each type of debt is grouped for you in a pie-chart so you can quickly see where your money is going. 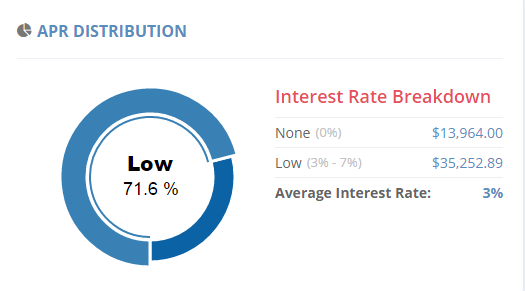 There's also an annual interest rate breakdown so you can target accounts with high interest rates. You can also see your overall, current average interage rate (which factors in promotional interest rates too!). 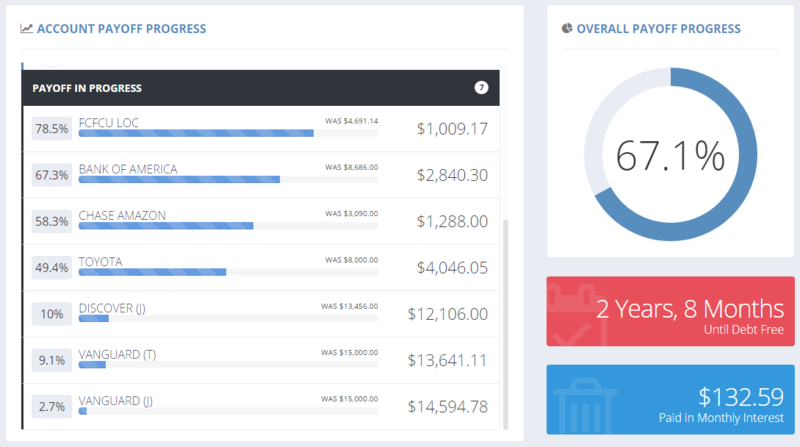 The progress page is dedicated to showing you a quick snapshot of your overall payoff progress. See which debt accounts have been paid off and you can also see how far along you are on your active debt accounts. You are also shown exactly how long it will take you to be debt free and how much you are spending in interest each month.